Short hair, don’t care! 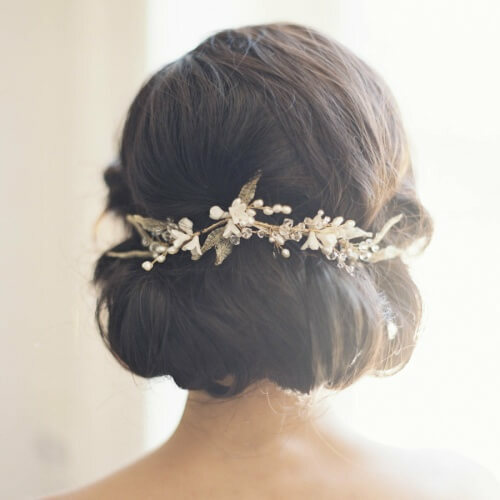 Brides can look brilliant on their wedding day even if they don’t have long locks. In fact, there are some wedding hairstyles for short hair that even outshine those for waist-length strands. Get ready to put your creativity to the test by using smart accessories, volume tricks and more through the examples we have prepared below. 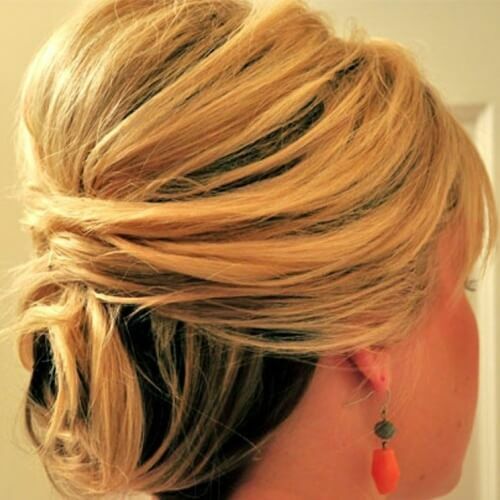 Updos may seem like an impossible task to achieve with short hair. However, the secret is in the technique. Work with your short locks by wrapping them over each other on all sides and using plenty of pins to keep them in place. If you can’t seem to get a hang of updos due to the length of your hair, you can always play around with low buns. They’re far easier to achieve for women with shorter hair, and they also serve as chic and tasteful wedding hairstyles. Regardless if you have arched, short or side-swept bangs, you should make the most of them with your wedding hairstyles for short hair. 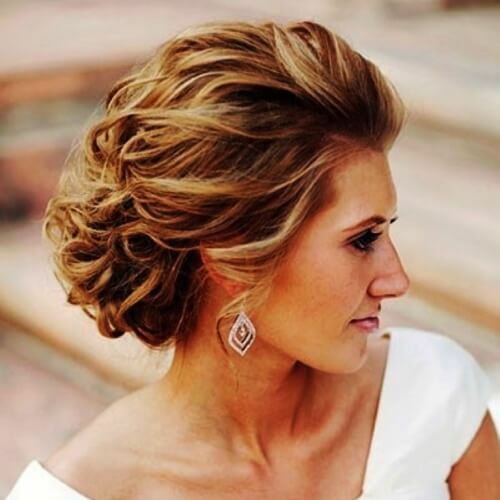 If you fall under this category, we recommend a bridal hairstyle that accentuates your bangs, such as a updo. If you want to emphasize your sensuality on the big day, go for a romantic hairstyle. You can combine elements from high or low updos, gently sweeping your hair into place. Retro accents will always make your hairdo shine. It may not be as easy to get a half up hairstyle if you have shorter hair than if it would have been long, but you can improvise. Use accessories to gather your strands and pin them at the center back part of your head. You genuinely can never go wrong with a loose hairstyle for fancy events. As the bride, you can accentuate your feminine side with a loose updo. 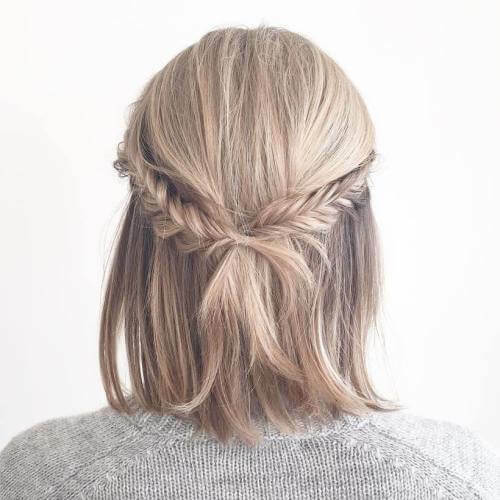 Don’t hesitate to leave a few strands loose in the front for a charming effect. You may think that styling is extremely limited if you have a pixie cut, but accessories are here to save the day. 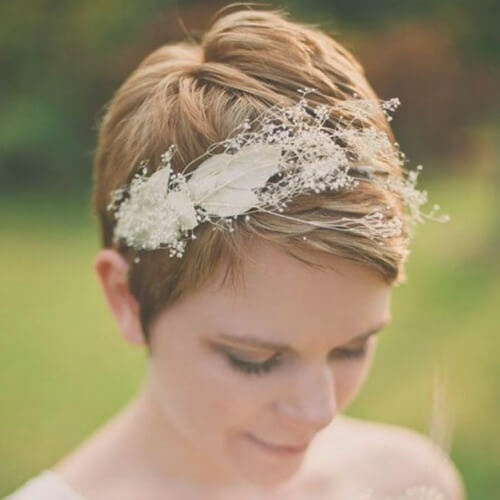 Women with pixie hairstyles can look into cute additions like headbands to brighten up their look on their wedding day. If you feel that a low bun isn’t spectacular enough for your bridal appearance, you can mix it with another hairstyle. For example, you can start off with a loose faux hawk and work your way down to a low bun at the back of your neck. You don’t always have to get complicated with wedding hairstyles for short hair. Sometimes, a few loose curls are more than enough to complement bridal jewelry, makeup, and gowns. This way you can focus on your lovely facial features. Side-swept hairstyles will always be symbolic for femininity. Even if you have shorter hair, you can use pins for holding it in place on the side. Using a rolling technique will also help for getting the outcome you desire. What if you’re not the bride, but one of her good friends? In these situations, it’s best to go for a classy yet simple hairstyle, so you won’t take the bride’s shine away on her day. You can delicately comb your hair to the side and use a cute hair pin. If you generally wear your hair with a part down the middle, you can incorporate this detail into your bridal hairstyle. 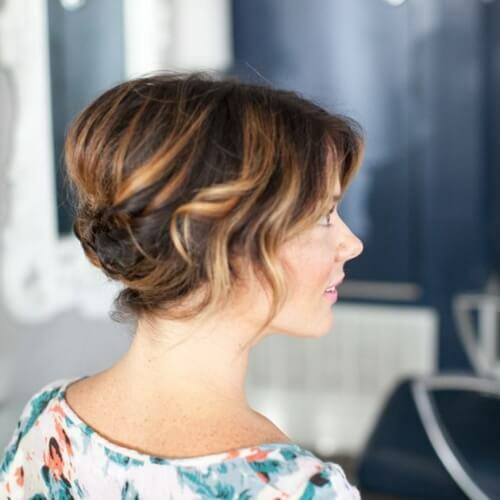 After parting your locks, we recommend wrapping them in a small low bun and leaving a few around your face in the front. As opposed to the ornate headband in our pixie hairstyle example, the one in this photo stands out through simplicity. Thin and bejeweled, the headband Jennifer Lawrence is wearing in this shot is perfect for wedding hairstyles for short hair. On the other hand, you can decide on highlighting a side of your hairstyle. 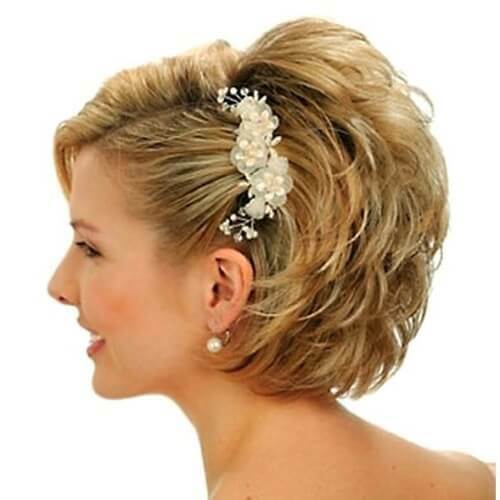 You can start out by searching for a hairpin or hairpiece that flatters your wedding gown. Afterwards, choose which side you want to pin it on. If you have a bob haircut, especially an angled and stacked one, you may find difficulty in trying out updo hairstyles. Nevertheless, bobby pins save the day once again. Use two or three to pin back a few strands for a pretty faux updo. Elegance can also be easily represented by sweeping back your hair. To get the look, it helps if your hair is naturally wavy or curly. All the same, you can use a curling iron to obtain the dynamic effect of a voluminous swept-back hairstyle. 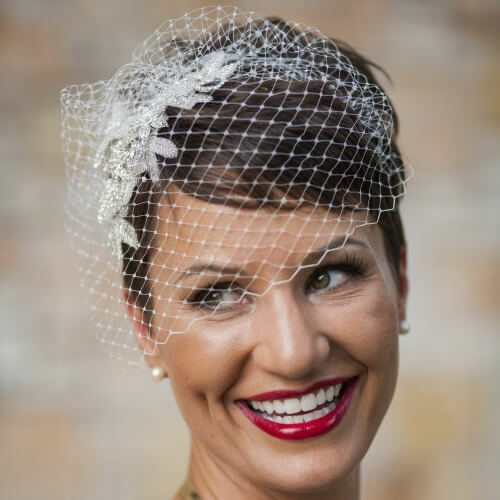 We couldn’t forget about wedding hairstyles for short hair with veils. It is your wedding day after all, isn’t it? Well, we couldn’t encourage you more to leave your hair down or half up for the best results. Your veil will fall into place flawlessly. What if you’re planning a nature-themed wedding outdoors? It would be more than appropriate to put together a bohemian appearance to go with the atmosphere of the event. In addition to vintage wedding gowns, you should also think about boho hairstyles with flowers. Scarlett Johansson proves in this photo that 50s-inspired hairdos will never go out of fashion. You can use this photo as a reference if you want to give your bridal look a retro vibe. Focus on the gentle curls and side-pinned aspects of the hairstyle. Chignon hairstyles come in all shapes and sizes, from classic examples to modern adaptations. If you want to get the best of both worlds, mix a bit from both and add a tiara at the back for a picture-perfect finish. Some of the most popular wedding hairstyles for bridesmaids with short hair involve loose braids. Considering the length of your hair, you won’t be able to venture into complex braiding techniques. However, you can try out a half upside braid. Without a doubt, teasing is one of the most effective styling techniques for achieving more volume in your hair. If you decide on going for a half up half down or updo hairstyle for your wedding, use a comb to carefully tease the top for more volume. How beautiful can halo braids be? For a bride with short to medium-length hair, we honestly believe a crown braid is one of the most feminine hairstyles out there. We recommend this bridal hairstyle for all women, regardless of their complexion. If you can’t get the detailed hairstyle of your dreams due to your hair length, you can use your imagination to make the most of what you have. 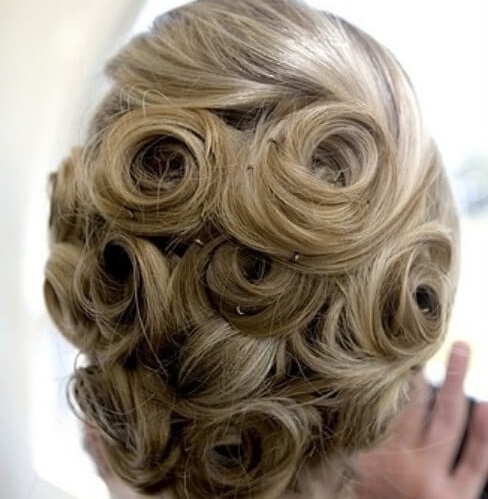 For example, you can curl the ends of your strands and pin them in swirls for an eye-catching wedding hairstyle. 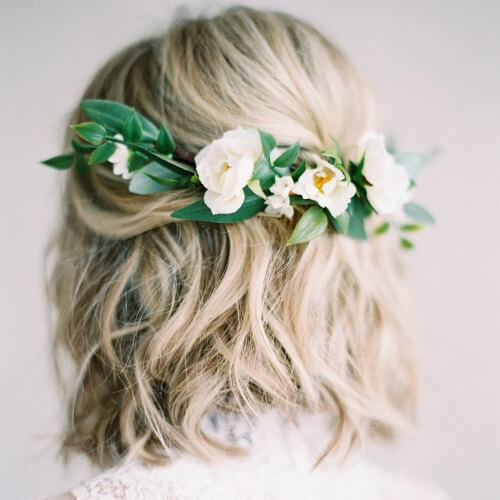 Here’s another gorgeous ideas for our brides with pixie haircuts. If you feel that sweeping back your hair doesn’t accurately represent your personality, you can try slicking it back. Make sure you slick and comb down the sides and back well. Ever since the peak of retro fashion, bouffant hairstyles have been a favorite for women worldwide. If volume is your main hairstyle objective, don’t hesitate to do research on bouffant bridal hairstyles. They also work wonderfully well with veils. For some women, getting a flattering wedding hairstyle is as easy as styling their locks to the side. Instead of tying your bun at your nape, you bring it all to the side you feel it looks best on. We especially recommend this method for women with side parted hair. To prove how impactful the right accessories can be for hairstyles, here’s a jaw-dropping example. You can find headbands that contain your favorite details and use it as the center point of your hairstyle. Better yet, you can create one from scratch to match your dress. Alternatively, go for a simple yet mesmerizing look for your wedding. This is the ideal hairstyle for women with significantly short hair, or those who aren’t interested in fancy updos. Yet again, the metallic headband saves the day for a marvelous hairstyle. What if you’re a woman with a strong sense of adventure? It’s your day, so go ahead and express yourself to the fullest through your appearance. You can add some edge to your wedding hairstyle by mixing in braided or faux hawk elements. While most women go for long veils in the back, some love the timeless beauty of birdcage veils. If you decide on getting this model, you should think about leaving the rest of your hair simply styled. In fact, you can just brush it elegantly into place and add the veil for the complete look. As long as your hair is shoulder-length, you can have fun with all sorts of braided hairstyles on your wedding day. If possible, we recommend trying out unconventional braiding methods. 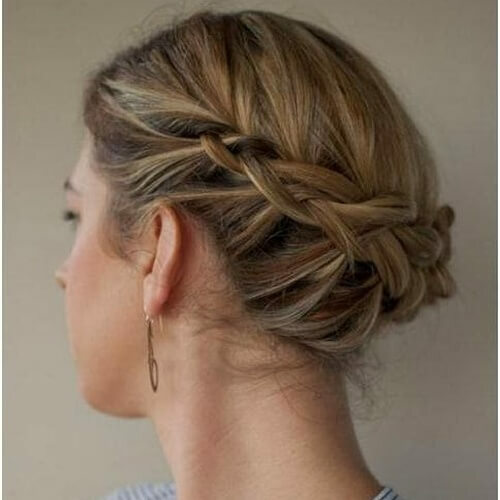 As an example, you can experiment with braiding your hair diagonally. You can probably tell by now that retro wedding hairstyles are among the most popular these days. For a vintage look that you won’t see everywhere, get inspired by the large curls and bold accessories in the hairstyle pictured above. Alternatively, you can go for effortless elegance with discrete accessories. A thin, metallic tiara will work wonders for any bride, especially if they have a low updo going on. You can place it right on the outline of the updo. 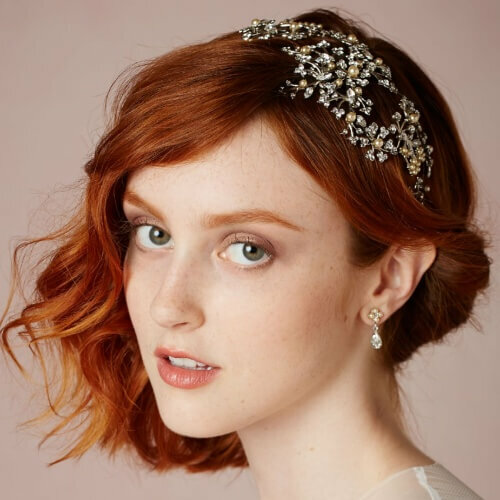 Not all glamorous hair accessories in wedding hairstyles for short hair are metallic. Actually, quite a few stylish ones don’t involve any metal at all. 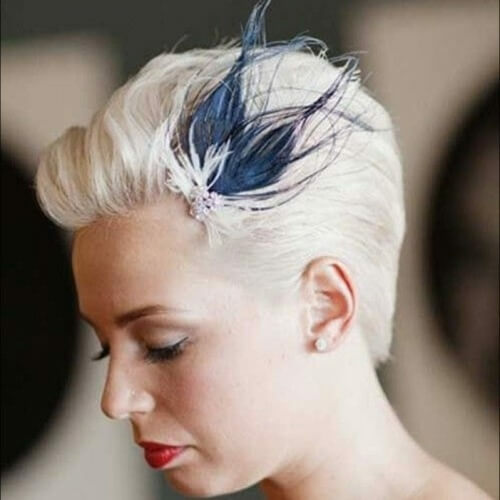 To support our claim, here is an example of a sophisticated hairpin with navy and white feathers. If you feel that you’re having a hard time getting your chignon in place, here’s a way you can trick your way into one. Part your hair half up and take a large section from each side, bringing them together in the middle with a hair tie. Afterwards, wrap the lower part up and into the rest. 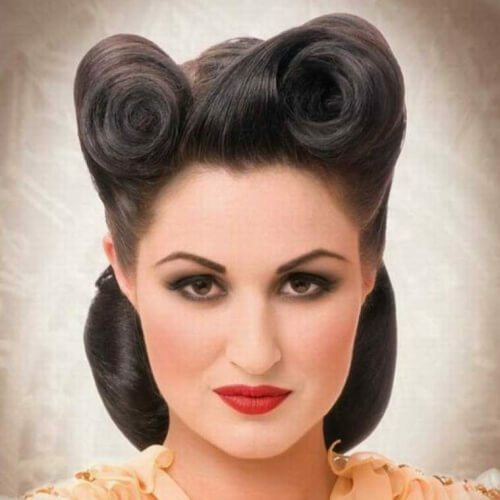 Soft waves or finger waves are a definitive part of vintage hairstyles. Keeping in mind that you have short hair, you can count on the refinement of highly loose curls to complete your look. This way, you don’t even have to worry about your hairstyle coming apart. We all know how trendy asymmetrical hairstyles have become in the past several years. Even though they wouldn’t necessarily be regarded as classic wedding hairstyles, they do serve as the perfect foundation for ones with veils. Aside from being one of the most memorable days in the lives of the bride and groom, weddings can also be a source of continuous stress. We say that you should live a little and make your choice from messy wedding hairstyles for short hair. We promise it’ll look fab. Another part we love about faux hawk hairstyles is that they don’t have to use all of your hair. You can use just half of your locks for twisting them into a faux hawk, leaving the rest down on the back of your neck. It’s the perfect mix of sassy and classy. 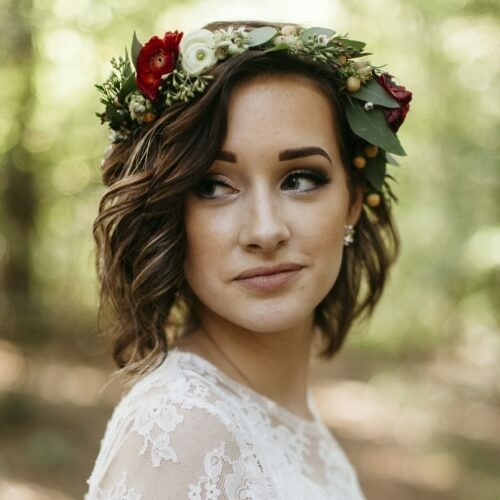 To prove our point about the natural beauty of boho wedding hairstyles, here’s an example that will definitely win your heart over. 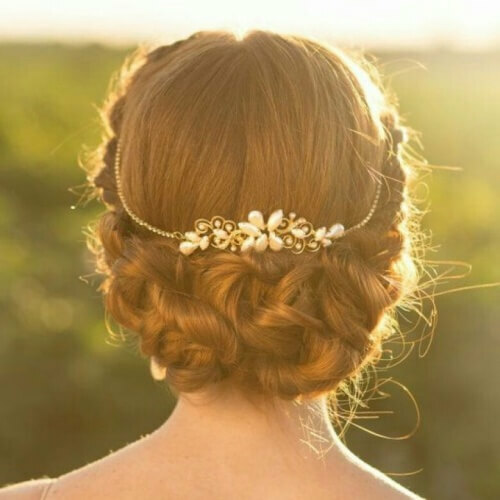 The hairstyle involves nothing more and nothing less than a flower crown – the ultimate bohemian hair accessory. Pixie gals, here is another inspiring example for your bridal hairstyle. Skip the pins and accessories and focus on styling only your locks. Try a ruffled technique using your fingers and add hairspray to keep your feisty strands in place. What if you want a crown braid that doesn’t result in having a halo shape around your head? Rest assured that the back crown braid is just what you need. It can easily take the place of a chignon or low updo, adding grace to your hairstyle. Rockabilly and pin up hairstyles will certainly make the bride a sight for sore eyes. To get a signature pin up wedding hairstyle, you should think about using victory rolls on the top part or sides. We guarantee you will be radiant. Nowadays, peekaboo hairstyles can be found everywhere. 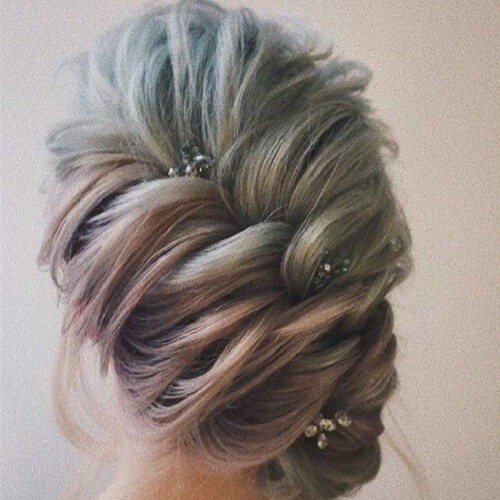 If you have a hair color underneath that is different from your top coat, you may want to have a bridal hairstyle that shows off the contrast. A chignon will do the trick. 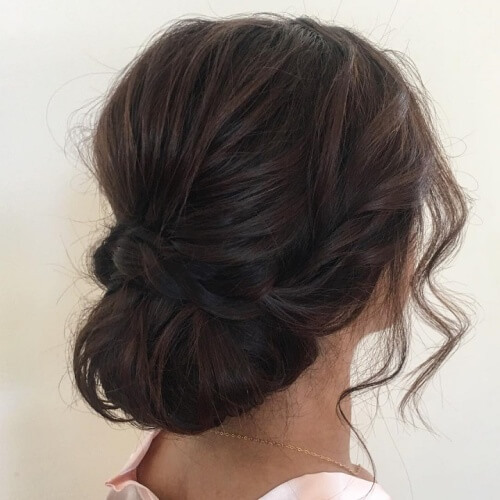 Even though it’s challenging to get a full updo with shorter hair, it is doable. Firstly, you have to ensure that your hair is at least half-neck length to be able to style it upwards. Secondly, you should think about working with a professional stylist for the best outcome. Want to make your half up wedding hairstyle stand out? Repeat after us: b-r-a-i-d-s. Use the two sections of hair that you’ll connect in the middle and create a braid for each. Three-strand braids and fishtail braids work the best. 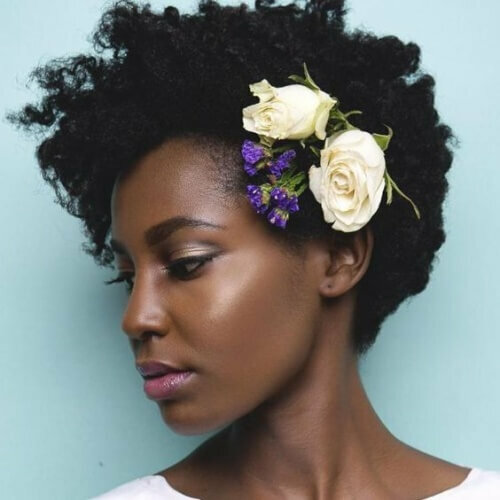 If you rock natural hair, show off your gorgeous curls on your wedding day. You can make them pop by picking an accessory and strategically placing it in your hair. For example, the natural flowers in this hairstyle are simply perfect. Are braids not an option, due to the length of your locks? No matter – you can use twisting as your go-to styling technique. All you have to do is choose the strands you want to work with and tightly twist and pin them in place. Last but certainly not least, we want to leave you with inspiration for outgoing wedding hairstyles for short hair. You can always make up for the lack of length with a statement accessory, like an oversized flower to go with your gown. 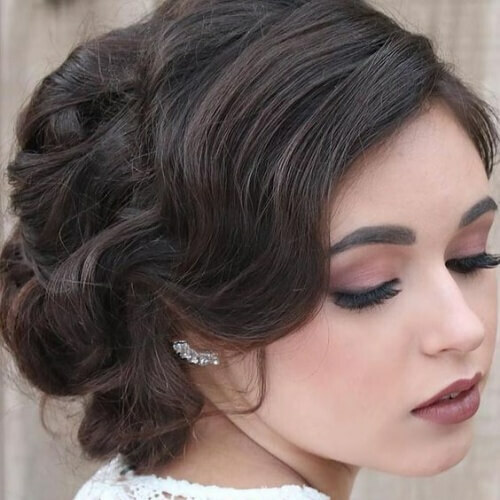 In summary, you can have a blast trying out all of these wedding hairstyles for short hair. 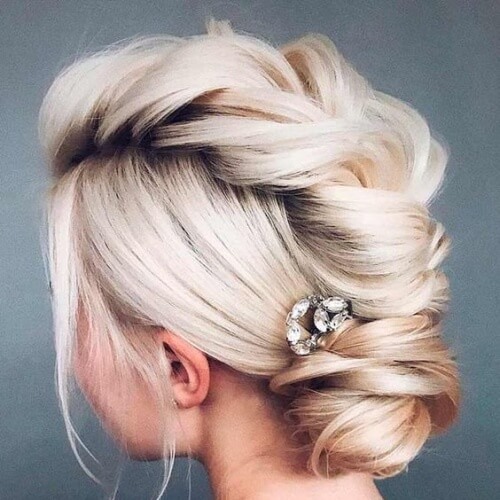 We believe that the experience itself will help you use your imagination to find the perfect accessories or faux updos to complement your style. 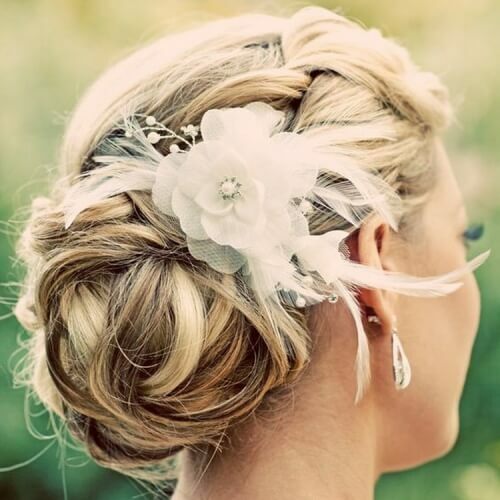 Make sure you let us know what short bridal hairstyle you chose for your wedding day in the comment section!